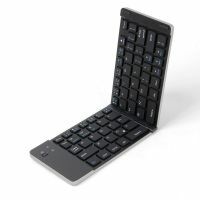 Folding Design for Convenience: The Bluetooth keyboard can be folded into a 14.6cm x 8.4cm x 1.5cm rectangle. You can put it into the pockets and purses with ease. This makes it a must have device when you are traveling. Unfold the keyboard, you still have all the benefit of a natural typing. 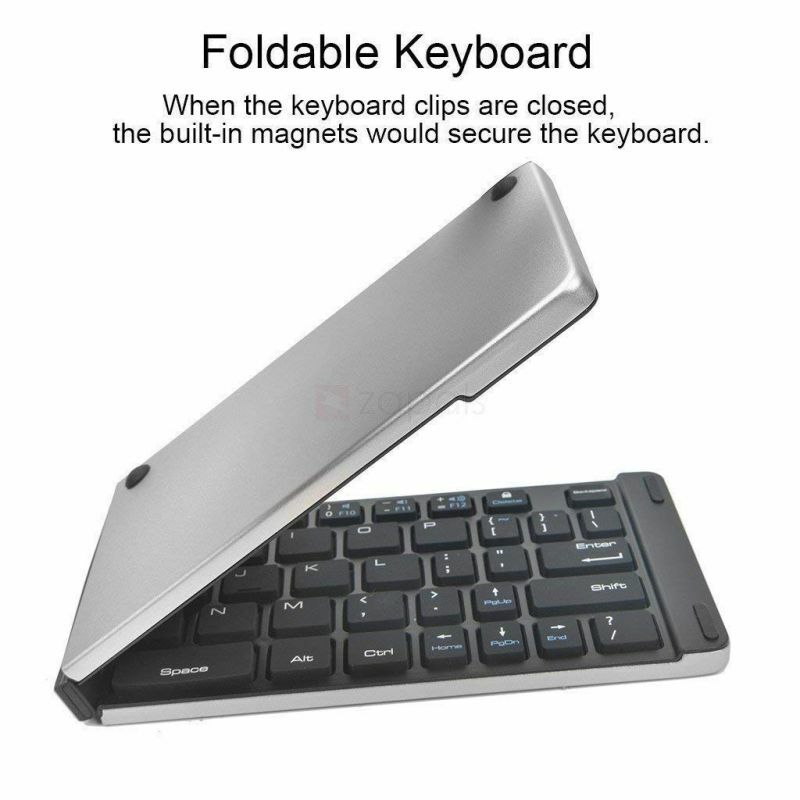 Automatically Turn on / Turn off Function: The keyboard is automatically turned on when you open it and enters into sleep mode when you fold it. This makes it easy to use and will save the battery power. 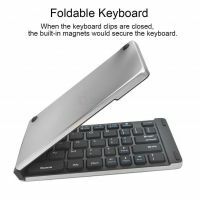 Compatible with iOS, Windows and Android Systems: The Bluetooth keyboard is compatible with iOS, Windows and Android smartphones and tablets. 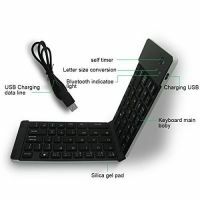 So no matter which device you are using, the Bluetooth keyboard is your ideal choice. 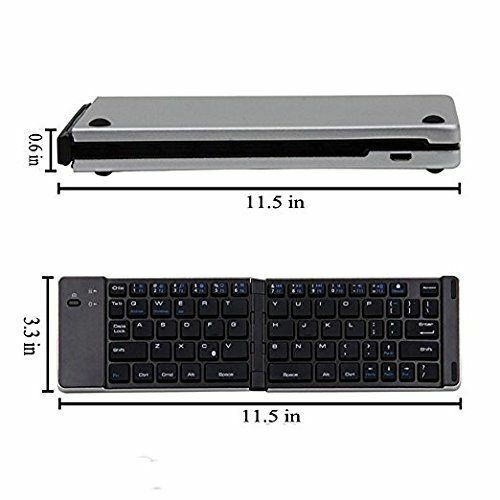 Bluetooth 3.0 Technology: Featuring Bluetooth 3.0 technology, the wireless keyboard allows you the freedom to work within the operation range which is up to 10 meters. 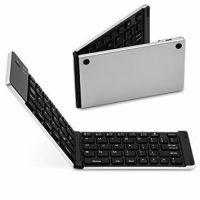 Aluminum Shell for Superior Quality and Durable: The outer shell of the Bluetooth keyboard is made of high quality aluminum which can protect the keyboard form scratches and drops. 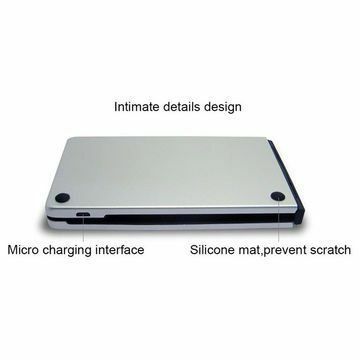 The matt coating gives the keyboard excellent sense of touch. The alphanumeric keys are the same size as regular desktop keyboard, the punctuation and enter keys are just a little narrower, which makes switching back and forth easy. When folded, it's small enough to put in your pocket. And it's so light, perfect take it along with you in your backpack everyday. The amount of key travel is great, the tactile feel is better than most wireless keyboard. On one full charge, the keyboard will work for a long time. Has built in function of auto power off and sleep when folding/unfolding it.